Brown sugar and sour cream help make these cupcakes moist and delicious. For a brown sugar chocolate cake, double the recipe and bake in 3 9 inch round pans. Preheat the oven to 350 degrees. Line about 18 cupcake cups with paper liners. 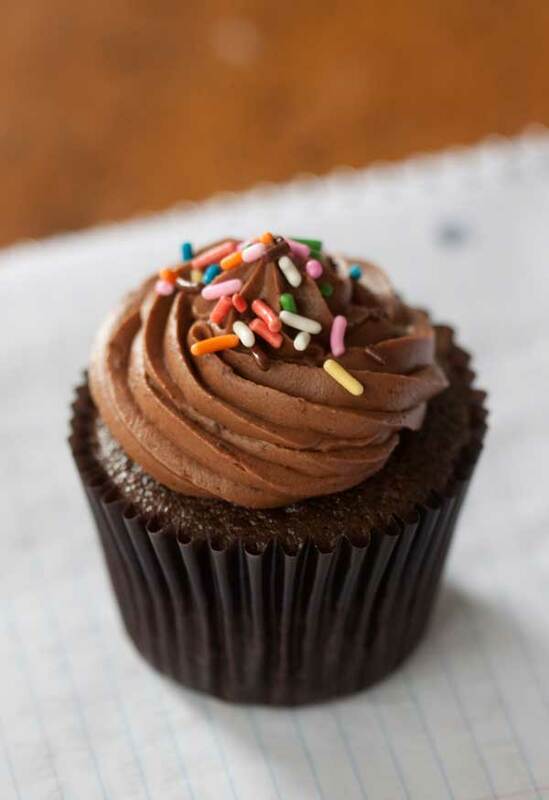 You may need more or fewer liners depending on how deep your cupcake cups are. With an electric mixer, beat the butter until smooth. Add the sugar and beat well, then add the eggs and mix until fluffy, scraping bowl often, about 3 minutes. Beat in the vanilla, cocoa, baking soda and salt. Add 1/2 of the sifted flour, then 1/2 of the sour cream and mix. Repeat with the remaining flour and sour cream. Drizzle in the hot coffee and mix until smooth. The batter will be thin. Pour batter into cupcake cups coming a little over halfway full (almost 2/3, but not quite). Bake on center rack for 22-25 minutes or until cupcakes spring back when touched. Let the cupcakes cool in the pan for just 3 minutes, then carefully remove them from the pan and let cool on a wire rack. Frosting: With an electric mixer, beat the butter and cream cheese together until smooth. Drizzle in the melted chocolate and mix. Add half of the sugar and mix well, then add the coffee and vanilla. Beat well, scraper bowl and add remaining sugar. Beat until creamy, and adjust sugar and liquid if needed. The yield will vary depending on what size cupcake liners you use. I like to use 2 x 1 3/4 inch cupcake cups which are slightly taller. For this size cupcake, you'll get 16. Also, I used natural cocoa powder for the cupcakes in this photo, but the original version calls for Dutch. In cupcakes the two were interchangeable, but if you are making these as a cake you might want to stick with Dutch.